Can I combine any size recycling receptacles I would like into a recycling station or do I need to use all of the same diameter recycling cans to create a connected unit? While it is common to order three recycling receptacles of the same diameter (for example 15”) and connect them with Glaro connectors, you can use any size receptacle from any Glaro recycling receptacle line in any configuration you want and create your own combination. 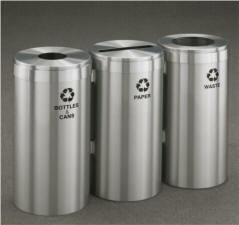 Glaro recycling receptacles are specially designed to be able to form any look or configuration you desire. This flexibility is possible because Glaro Inc. connectors are universal, allowing mixed sizes of receptacles to be easily connected. Example 1: You can have one 20” diameter can in a central position combined with two adjacent 15” receptacles (one for recycling cans and one for recycling bottles). Each unit can be used individually, or they can become a recycling station with a Glaro connector set. Example 2: Alternatively, you could have two 20” receptacles in outside positions with two 15” recycling receptacles in inside positions, creating a four piece station. It is up to you. Or, as we mentioned, you can use them individually or connect two or more units using our connectors. Glaro Inc. factory connector holes will be positioned according to the desired recycling receptacle layout configuration you order. Specifying your configuration first allows Glaro to provide the appropriate connector hole positioning on each unit. Pre-drilled holes in the appropriate locations make assembling receptacles at their final destination a simple, straightforward process requiring minimal work.
. Note the varying openings available e.g. slots, holes or slots with center holes. Specify the silk screened message you would like on each (bottles, cans, paper, waste, or bottles & cans). Each can comes standard with a recycle logo except the can for “waste”. Messages are silk screened onto the bodies below the recycle logo. Order optional clear poly liner bags to fit your receptacles. Call (631) 234-1717 for more information or to speak to a salesperson.